Description: World premier release of the complete session on CD! Trade Winds was a Polynesian restaurant located in Inglewood, California. The regular Monday night jam sessions in the bar lounge were very popular through the 1950s because many name musicians "sat in." At that time, most jazz clubs in the LA area were closed on Mondays. 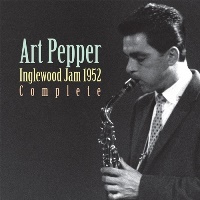 This album consists of the two sets from the jam session on August 18, 1952. The rhythm section was told before the first set started that they would need to leave for a soundtrack recording after the set. Al Haig (p) was one of the three musicians who stepped in to complement the second set. This last-minute change brought about the historic, once-in-a-lifetime Pepper-Haig performance. In addition to Art Pepper and Haig, the six tracks on this CD feature such great musicians as Jack Montrose, Jack Sheldon, Chet Baker and Russ Freeman. A historic record and an important CD for fans of Art Pepper! Recorded on August 18, 1952 at Trade Winds, Inglewood, California. Mono.